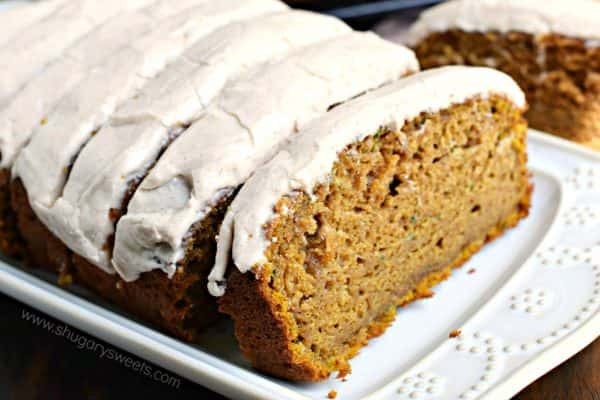 Pumpkin Zucchini Bread is an incredibly moist, flavorful treat topped with a cinnamon cream cheese frosting! Makes TWO freezer friendly loaves! I have a confession. I already have made my Pumpkin Scones recipe twice and have two other (NEW) pumpkin recipes ready to share! It’s true. I’m obsessed. Back in July, my zucchini crop was overflowing. 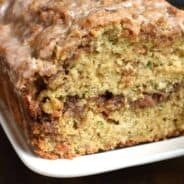 It was so abundant that I was not only giving zucchini away, but I was baking nearly EVERY SINGLE DAY for weeks. My freezer is still packed with some of these delicious breads and muffins! But, I knew eventually ya’ll would get sick of zucchini…so I moved on last month…to these chocolate cookies, this chicken chowder, and a couple of fudge recipes. Little did you know, I saved the mother of all zucchini recipes for NOW. 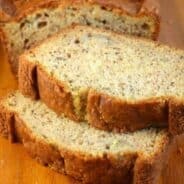 I’ve combined the use of zucchini with my favorite fall flavor: PUMPKIN, to create the most delicious, moist bread ever. And if that wasn’t enough, the cinnamon cream cheese frosting on top will make you swoon. So…tell me….do you love pumpkin recipes? Or are you like my husband who is waiting for pumpkin season to be over so I can start pulling out the peppermint? 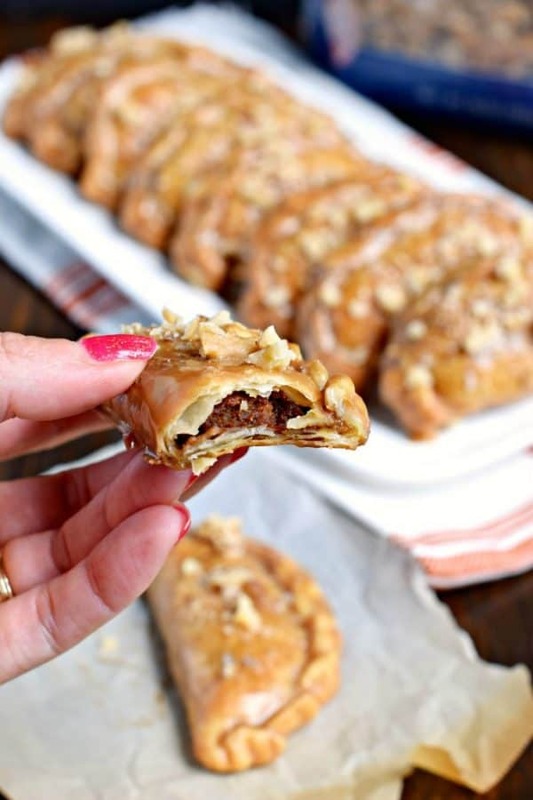 Pumpkin Hand Pies: easy to bake, and perfect for the holidays! 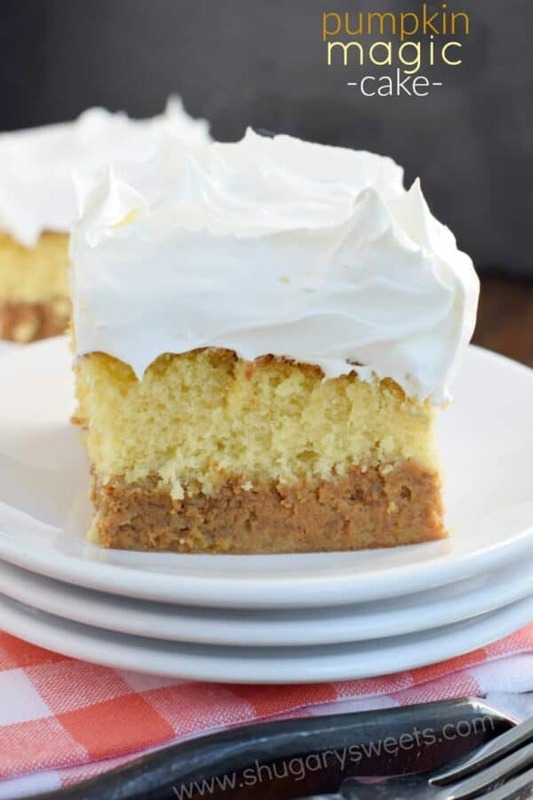 Pumpkin Magic Cake: you’re going to love how the layers separate magically in this recipe! 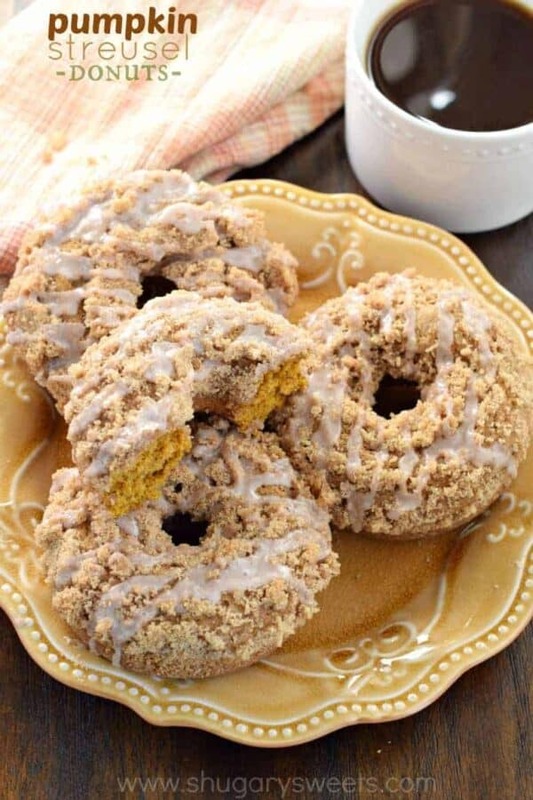 Pumpkin Streusel Donuts: I could eat these every morning! 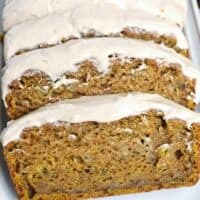 Pumpkin Zucchini Bread is an incredibly moist, flavorful treat topped with a cinnamon cream cheese frosting! Preheat oven to 350°F. Spray two 9-inch loaf pans generously with baking spray, and line the bottom of the pans with parchment paper. Set aside. In a large mixing bowl, combine sugar, oil, and eggs until blended. Add in flour, baking soda, baking powder, cinnamon, cloves, ginger, nutmeg and canned pumpkin. Mix just until blended. Fold in shredded zucchini. Divide batter evenly between the two loaf pans. Bake for about 60-70 minutes, until toothpick poked in center of bread comes out clean. Remove from oven and cool 5 minutes in pan. Remove from pan and cool completely on wire rack. For the frosting, beat the cream cheese with powdered sugar, cinnamon, and milk. Add more/less milk for desired consistency. Spread over cooled bread. ENJOY! This sounds delicious! 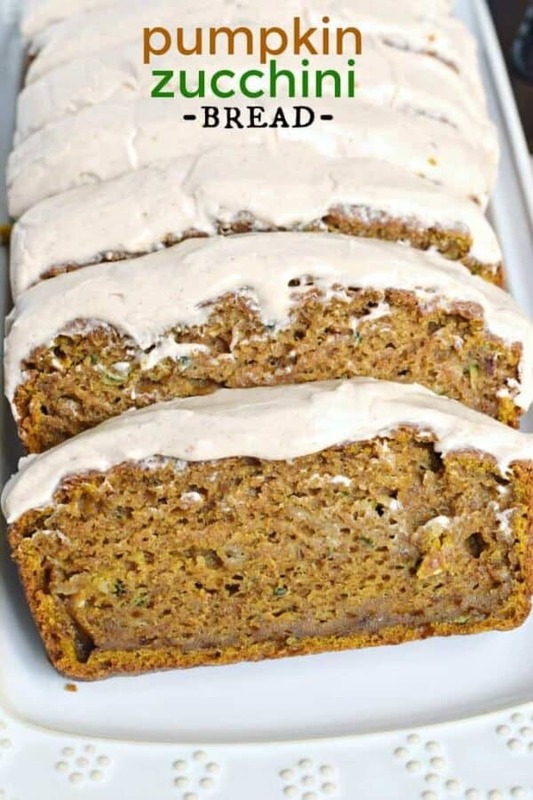 I love pumpkin and zucchini bread, I cant wait to try them together! Love that you get 2 loaves from this recipe! One to enjoy now and freeze one for later (if it doesn’t get devoured first, right?! haha The cinnamon cream cheese frosting sounds divine! 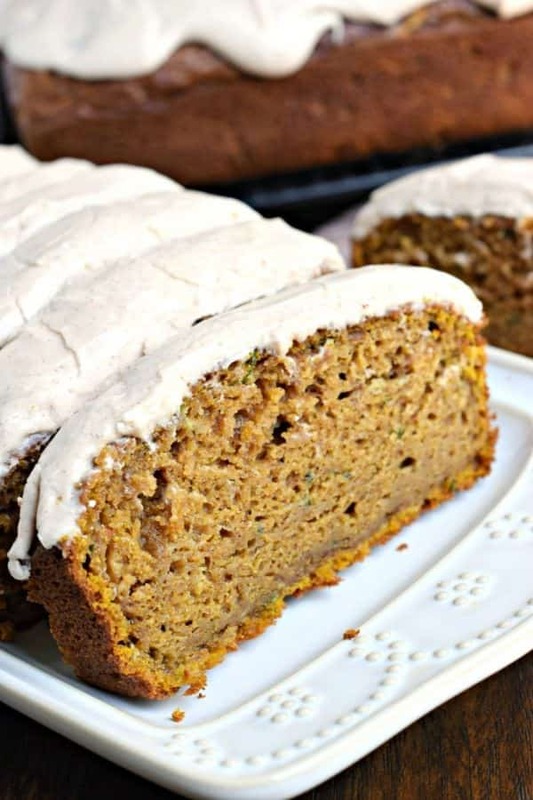 My whole family loves zucchini bread and pumpkin pie, so I bet they’d like this bread too. I’ll have to pin it to try soon. Thanks for sharing. The moisture level (in a good way) must be through the roof with both pumpkin and zucchini. I love this idea to combine them. I would eat this whole thing, seriously. Could not resist! I so adore pumpkin and am drowning in drool right now – loving the double veggie action in this loaf – I so wish I had a slice (or 5) to help this afternoon slump! Yum! This looks so moist! Unfortunately this recipe did not include salt…..need I say more??? Wish I would have noticed before I wasted the ingredients and time. I make this all the time and it turns out just fine! OH MY GOSH, this was the best zucchini recipe ever!! This bread was more like cake! I shared it with my parents and co-workers and it was a big hit. This is a keeper…super easy to make and absolutely delicious! Thank you. 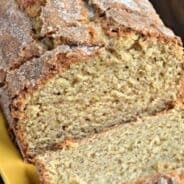 Love your website and will be trying more recipes. Made this recipe and it was awesome……no salt needed!! This is a nice bread. I looked at the reviews and saw the comment about there not being any salt and decided to taste the batter after mixing everything except the zucchini to see if I thought it needed it. I did think that something was missing and decided to try 1/2 tsp salt and re-taste. I added another 1/2 tsp and it had a much better flavor. Salt brings out something in sweets and I do feel had I not added the salt it would not have been as good. Thank you for the recipe. My cakes are in the oven, but I added salt afterm noticing it’s absence…also using a bundt pan, added 2 handfuls of thawed frown blueberries (tossed with some flour). Waiting for the timer to go off, but pretty sure of success. I am wondering if it would be ok to use vegetable oil instead? I don’t have canola on hand? How much pumpkin pie spice could be substituted for the spices listed? I have made many batches of this and my grandsons love it! The only change is I add white chocolate chips and skip the frosting. Yummy. Thanks for the great recipe! Skip the frosting??? WHAT??? 🙂 Love the addition of white chocolate chips! Glad you enjoy the recipe! I made this today for a working bee morning tea. Not a crumb left. I had about 1/4 cup walnuts left and rather than waste them I added to this. Was absolutely beautiful. Will definitely make again. THIS IS AWESOME BREAD,GREAT FLAVOR,TEXTURE SMELL! Can you post a gluten free version…is that possible?? ?